Valeant Pharmaceuticals posted revenue and earnings for the quarter that came up short of expectations on Wall Street on Tuesday, but kept its forecast for the full year as it attempts to restore confidence in its investors after its business practices were highly criticized. Valeant shares jumped over 6% in trading before the bell following the posting of its earnings. The drug maker, based in Canada, over the last year has faced great investor and political scrutiny for the steep increases in its drug prices and the unorthodox method it used a specialty pharmacy. The company, which has debt close to $30.76 billion, also needed to make amends with its creditors after it missed deadlines for the filing of its financial reports that automatically triggered notices of default. 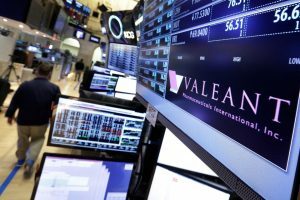 Nevertheless, Valeant said that its 2016 full year adjusted per share earnings would be between $6.60 and $7.00 per share, versus an estimate by Wall Street of $6.53 per share. The company said its annual revenue would be between $9.9 billion and $10.1 billion. Bill Ackman an activist investor and member of the Valeant board has said the company does not have any plans to sell its core assets such as Bausch & Lomb. Last month it was reported that J. Michael Pearson the former CEO of the company unloaded more personal holdings than was originally thought. The former CEO sold close to 5 million shares as well as options for more than $96.5 million. That news was released on the day that it was revealed Sequoia Fund does not hold any more Valeant stock. At one time, Sequoia was the largest shareholder of Valeant. The Canadian pharmaceutical company was criticized after a report from a paper in New York said that Valeant, as well as other pharmaceutical companies, had been using a group of specialty pharmacies as a way to sustain sales of their own drugs that are sold for very high prices and to prevent patients as well as insurers from making a switch to generic drugs that are far cheaper. Valeant in response to the report formed its own ad hoc committee as a way to review the report’s allegations regarding Philidor RX the specialty pharmacy.